SurveyUSA has a poll of immediate reaction to President Bush's decision to commute the prison sentence of Scooter Libby. SurveyUSA uses Interactive Voice Response (IVR) "automated" polling rather than human interviewers. But for a quick reaction poll of a breaking news story, this poll shows the advantages of speed that are possible with IVR technology. SurveyUSA interviewed 1500 adults nationally within three hours or so of the news that President Bush had commuted the sentence. Of the full sample 55% (825) said yes to the question: "Are you familiar with the legal case involving former White House employee Scooter Libby?" President Bush has commuted the portion of Scooter Libby's sentence that would have required Libby to serve 30 months in prison. Libby remains a convicted felon - he still must pay a 250 thousand dollar fine and serve 2 years of probation - but he will not go to prison. Based on what you now know, should the President have pardoned Scooter Libby completely? Should the president have taken no action, and left the prison sentence in place? ... Or, do you agree with the president's decision to commute the prison portion of the Libby sentence? As SurveyUSA points out, an advantage of the instant poll is that it can measure opinion before the inevitable political spin begins to affect opinion. One problematic issue is that SurveyUSA filtered respondents for awareness of the Libby case. I suspect a number of polls to be taken over the next few days will vary in whether the filter for awareness or not, making direct comparison among all the polls to come somewhat difficult. 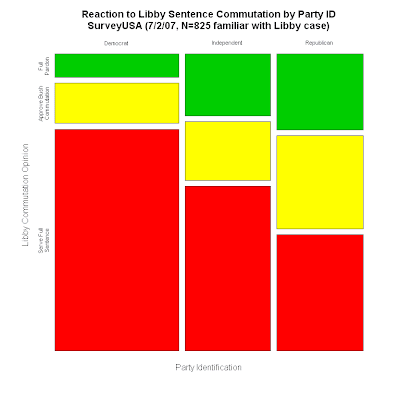 By applying this filter, SurveyUSA should be expected to include people with greater awareness of the issues in the Libby case and presumably more settled opinions on this case than if they had included all 1500 respondents, including the 45% who said they were not familiar with the case. 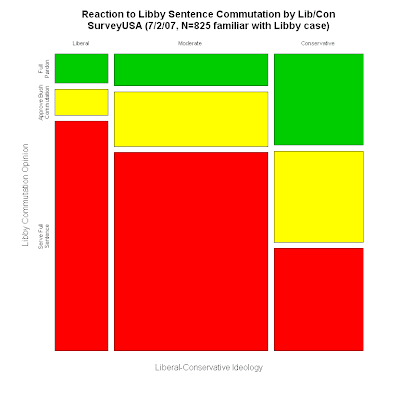 Given the discussion the Libby case has received on talk radio, blogs and MSM it is interesting that 45% didn't feel they were familiar with the case. This opens considerable opportunity for opinion to be swayed either direction in the next couple of days. But what of those who were familiar? If we shift to partisanship we see a similar but not identical distribution. Democrats favored prison by 77%, approved the commutation by 14% and 8% thought a full pardon was called for. Fifty-six percent of Independents wanted jail, with 20% approving the President and 21% wanting a pardon. But again when we come to the Republican base, we find a really surprising 40% saying the Libby should have served time in prison. Thirty-two percent supported Bush's decision while 26% wanted a pardon. Now we might expect to see lowering of support for prison among conservatives and Republicans over the next few days as Republican opinion leaders send the message that they support the commutation (assuming they send that message). And it will be interesting to see if subsequent polling agrees with this instant snapshot from SurveyUSA. But the commentary going into this action by Bush stressed the dilemma he faced between satisfying the base and further offending independents and moderates. So far, the evidence is that the action he took has failed even to please a majority of the Republican and conservative base. Revision: This version of the graphics scale the column widths in proportion to the size of each group (Lib,Mod,Con) or (Dem,Ind,Rep). The first plots failed to do that. My bad. Thanks to Peter Flom for bringing the mistake to my attention.